– Sustained Involuntary Operation. Protection against involuntary operation of the platform’s hand controls is now required. The new safety measure will override and shut off the platform’s controls in the event of an accident. – Load Sensing. New systems will be required to closely monitor a platform’s load. When an overload is detected, normal operation will cease and an alarm will sound. – New Wind Force Requirements. Machines rated for outdoor use must be able to sustain winds of up to 28 mph. This could mean lower platform capacities and/or increased chassis weight for added stability. – Pneumatic Tire Requirements. The purpose is to avoid stability issues caused by failed air-filled tires. Some equipment will only be available with solid or foam-filled tires. – Tilt-Sensing Requirements. Machines will now be fitted with a tilt sensor alarm and override system that disables boom and drive functions if the incline exceeds the slope limit. – Entrance Gates. Chains and other flexible barriers can no longer be used as entrance gates. – Toe Boards. All four sides of the platform must now have toe boards. – Platform Railings. Small indoor forklifts will need taller railings. Some models will have folding rails that allow them to pass through standard doorways. These updated requirements apply only to new equipment. Machines built before the new standards were implemented won’t need to be retrofitted. MEWP dealers and rental companies will need to ensure the operating and safety manuals aboard the equipment reflect the latest changes. The most recent version of ANSI’s Manual of Responsibilities that includes all new definitions and requirements will need to be on board the equipment at all times. It’s the responsibility of equipment rental companies to ensure their customers understand the new safety standards. This requires companies to be sure their technicians are familiar with the new equipment features and safety inspection standards. MEWP training also applies to other workers. 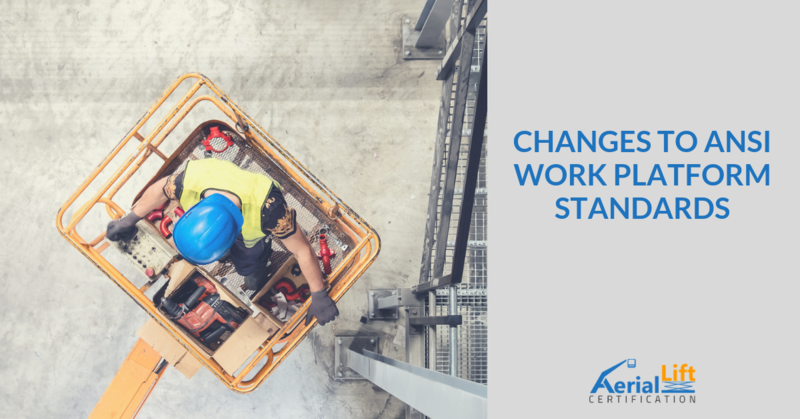 It’s now mandatory for supervisors, platform occupants, maintenance personnel and anyone else who comes into contact with MEWP equipment on a jobsite. Under ANSI’s new standards, training must be given by an instructor who’s familiar with and has hands-on experience operating the equipment. To qualify as a trainer, he or she also needs to be familiar with all current ANSI standards and OSHA regulations. These include safety practices, manufacturer’s requirements and specifications, and recognizing and avoiding potential jobsite hazards. Aerial Lift Certification’s 100% OSHA-approved Train A Trainer online course is a fast, convenient and affordable way to qualify an employee to train and certify other company workers. Students work at their own pace. All materials are available online 24/7. The course can be completed using a smartphone, tablet or laptop any time that’s convenient and anywhere there’s an internet connection. Our training materials are always up to date, including the latest ANSI standards and OSHA regulations. To get started today or for more information, click here. You can also contact us online or call us at 888-278-8896.